Online meetings are now just a couple of clicks away. Start an online meeting with our Meeting integration. Navigate to Zoho Apps under Integrations in your Zoho Projects setup and activate Zoho Meeting. To schedule meetings, you need to upgrade your Zoho Meeting subscription and activate the integration in Zoho Projects. Available in user based pricing plans. Zoho Meeting subscription is required. Click Calendar in the left panel and go to the Meetings tab. Enter a title for your meeting and set an agenda. Select the date and time for your meeting. Select the participants for your meeting. If you want to invite users other than the project/client users, click the External Users checkbox and enter their email IDs. Click Save. A meeting link will be generated. You can share this link to let other users join the meeting. A meeting invite will be sent to all participants. Participants will also receive a notification in Zoho Projects and the invite will be pushed to their Feed. Click Start Meeting. You will be redirected to an AV interface for the meeting. Click Start Sharing to share your screen with participants. You can instantly schedule meetings from the task details page. Select participants from project users and click Send Invite. A meeting invite will be sent to all participants. Participants also receive a notification in Zoho Projects and the invite will be pushed to their Feed. A meeting link will be generated. 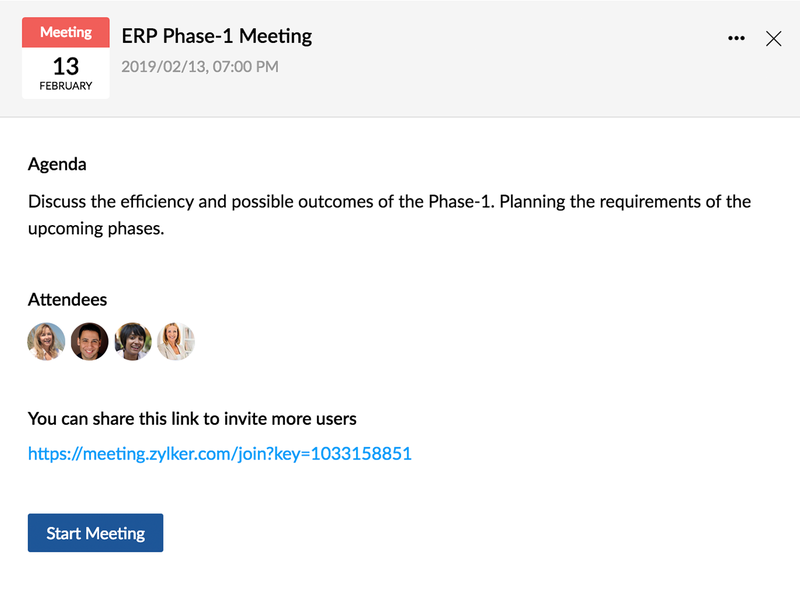 Share this link to let other users join the meeting. The users can be a part of only one Zoho Meeting Organization. When you integrate Zoho Meeting with Zoho projects, the users who are already part of other organizations cannot be added. All user roles except Viewer and Follower can start a meeting. 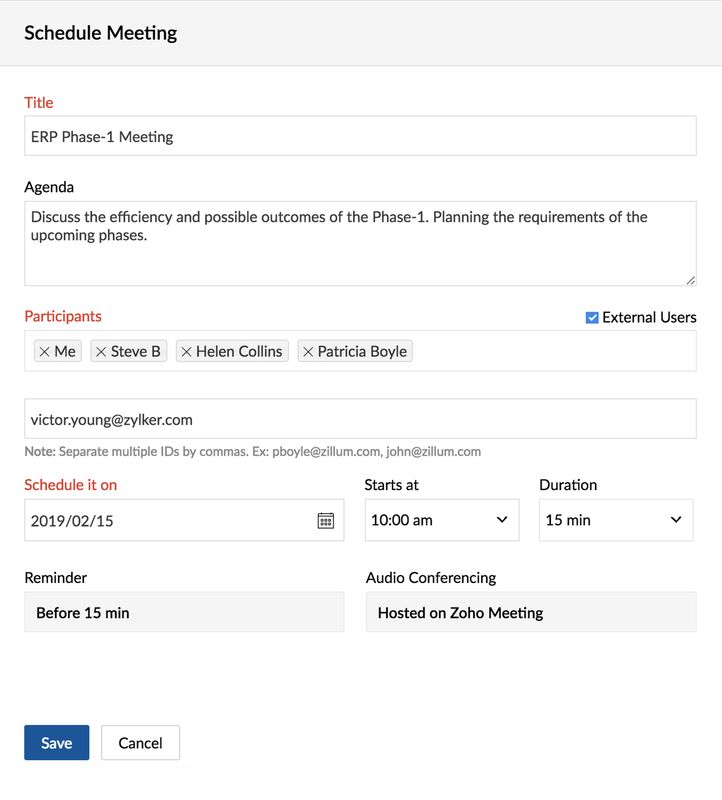 Participants can view a recording of the meeting from the feed and the meeting details page.